Welcome to The Gadget Professor Show #329 hosted by Don Baine. ➤Dotstone HDMI Splitter Just by looking at the rear side of this device, you realize how many thing it can do. Most importantly, it is an audio and video splitter. Therefore, you have one input HDMI port and two output ports. Basically, you can connect one appliance to the splitter and transmit the signal to two other devices. For example, by plugging something like a laptop, a TV box, a gaming console or even a smartphone into the input port, you get the opportunity to watch video on two screens simultaneously. Basically, that’s what you see in department stores where countless TVs always show the same picture. But at your house, you can translate the video signal not only to TVS but computers or other laptops. Besides, the splitter supports everything from Full HD to 3D and 4K resolution, which means that even the most glorious imagery won’t lose its quality after being transmitted to other screens. Easy operation: Plug and play. Audio and video synced flawlessly .Picture or Sound No Signal Loss.Provide you with Premium picture and sound while watching TV playing a game or listen to music. ➤Wide Applicability:HDMI Splitter supports Full HD,3D and 4K2K video.Support SPDIF digital audio format: Dolby digital (AC3), DTS, LPCM, and support 5.1CH.Support ARC audio output. LED numerous indicator lights that help in confirming connection statuses. ➤Latest Technology:HDMI splitter with 16 built-in EDID modes that can be cycled from a switch on the front panel to greatly enhance the compatibility between the devices you are splitting a source signal to. It supports all the latest audio and video formats including both optical and coaxial digital outputs and a standard 3.5mm analog jack. ➤Multifunction: HDMI Device have 2 Port HDMI Audio Extractor can allow two HD Display/TV connected to one HDMI Source and also can extract audio signals from the HDMI source. 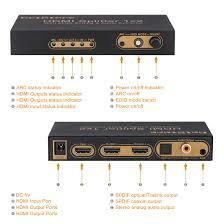 You can take your original HDMI audio signal and convert it to digital optical / Coaxial or analog audio output. This product supports Dolby digital AC-3, DTS, LPCM and other digital audio format output. It is one perfect audio extractor for your DVD, blu ray player, PS3, X360BOX, HD Player, projector,PC etc.